King Street Named a "Top 10 Great Street"
ALEXANDRIA, VA (October 4, 2011) - The American Planning Association (APA) today announced the designation of King Street as one of 10 Great Streets for 2011 under the organization&apos;s Great Places in America program. APA Great Places exemplify exceptional character and highlight the role planners and planning play in creating communities of lasting value. "King Street has been a Great Street since 1749. 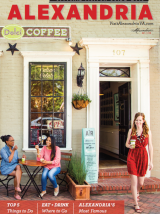 Through each subsequent era, King Street has successfully maintained its significance as Alexandria&apos;s commercial center and gathering place, thanks to careful planning, community involvement, and historic preservation," said Alexandria Mayor William D. Euille. APA singled out King Street as a bustling hub of activity - a place where people gather to celebrate, conduct business, explore the past, or simply enjoy a view of the Potomac River. The street&apos;s Colonial past is in evidence today due to a variety of foresighted protections adopted by Alexandria since its inception 262 years ago. To formally announce this prestigious award, a celebration will be held at the intersection of King and Union Streets beginning at 5 p.m., featuring music, performers, art, and food. At 6 p.m., Mayor Euille, members of Alexandria City Council, and the City of Alexandria will be presented with the award by the APA. Through Great Places in America, APA recognizes unique and authentic characteristics found in three essential components of all communities - streets, neighborhoods, and public spaces. APA Great Places offer better choices for where and how people work and live every day and are defined by many things including planning efforts, architectural styles, accessibility, and community involvement. Since APA began Great Places in America in 2007, 50 Neighborhoods, 50 Streets and 40 Public Spaces have been designated in all 50 states and the District of Columbia.